With our lifestyles becoming ever more sedentary, prolonged sitting is the new risk to our health. It can contribute to conditions such as cardio-vascular disease, diabetes and musculoskeletal conditions such as back and neck pain. Many of us sit for long periods at work, on transport to and from work, on the lounge and in the coffee shop. It’s no wonder that our circulation becomes static, our joints become stiff and strained and our muscles weak. If you have such a life-style that involves too much sitting a few changes can make a world of difference. Get up from the desk every 20-30 minutes and move, stretch, and walk around for a few minutes at least. Your muscles will start working and metabolising sugar, so it will also help your weight. Your joints will move out of sustained positions, your circulation will increase which has a positive effect on the body and brain. Take a lunch-time walk outside to refresh for the afternoon. Take the stairs, not the lift, and for an extra work-out climb two steps at a time! Then look at your chair-desk arrangement. Your desk should be at the height which has your feet flat, knees and hips at right angles and your back straight and supported. Your elbows are at your sides and also at right angles with wrists resting on the table. This requires having the chair pulled in close to the desk. 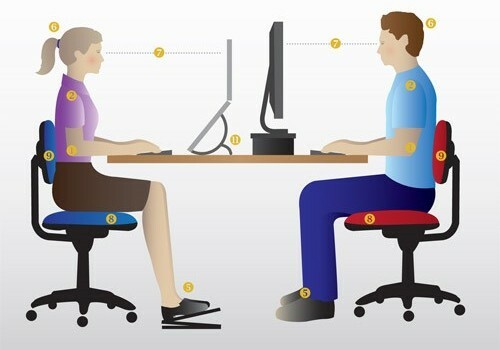 Your desk and computer should therefore be at a height whereby the top of the screen is about level with your eyes, and not too far away to avoid the ‘poked’-chin forward head posture. 1)Rotate the spine (neck and back) right and left. 3)Stand in a doorway, elbows at 90 degrees bend, forearms and hands on door frame and gently lean forwards to stretch pectoral muscles and hold 20 seconds. There should be no pain with any exercise. Good luck with your new, more active day.